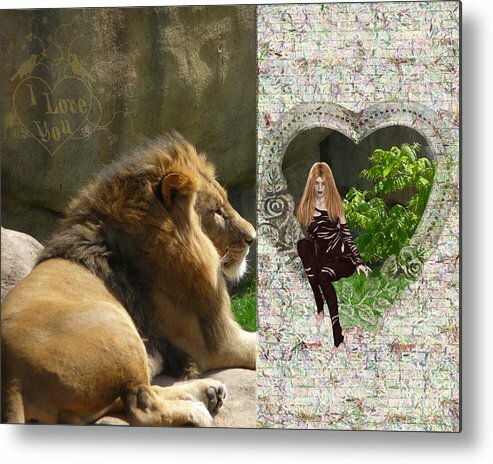 Lion Love by RiaL Treasures - 8.000" x 6.375"
Lion Love metal print by RiaL Treasures. Bring your artwork to life with the stylish lines and added depth of a metal print. Your image gets printed directly onto a sheet of 1/16" thick aluminum. The aluminum sheet is offset from the wall by a 3/4" thick wooden frame which is attached to the back. The high gloss of the aluminum sheet complements the rich colors of any image to produce stunning results. 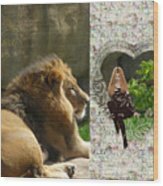 There are no comments for Lion Love. Click here to post the first comment. A split scene digital photo manipulation. 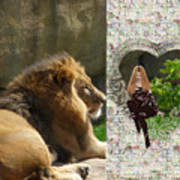 A sweet way of saying I love you to someone who loves the wildside of nature, yet has a sentimental heart. Hope you enjoyed viewing this creation as much as I enjoyed creating it. Thanks for viewing. I love to venture out in the warmer months and take photographs of nature abounding at local parks. I also love creating works of art digitally. I hope those of you whom happen upon my gallery enjoy what I have presented. Thanks for visiting.